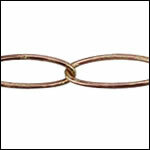 This unplated brass chain is perfect for applying your own antiquing, patina, paint, or dye. Or you can leave it raw and it will oxidize to a lovely dark brass color. 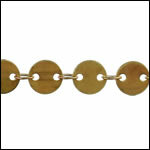 We started carrying this hypoallergenic brass chain, which is the core of all of our plated chains, by customer request. Some of our super creative customers use this raw chain to compliment their own handmade brass focal pieces.